India’s approach to Myanmar’s Rohingya crisis demonstrates the tension between its geopolitical interests and values. Indian Prime Minister Narendra Modi’s visit to Myanmar this week has once again underlined why New Delhi struggles to maintain a delicate balance between its strategic interests and its democratic ideals when it comes to its neighborhood. This visit came at a time when the Myanmar government and Aung San Suu Kyi are facing global condemnation for their handling of the Rohingya crisis in a repeat of what had happened five years ago during a military campaign that displaced more than 100,000 Rohingya. Suu Kyi does not control the military and there continues to be a trust deficit between the two. But her refusal to condemn military abuses against Rohingya provides the generals with political cover. Myanmar is negotiating with China and Russia to ensure they block any UN Security Council censure over the violence that has forced an exodus of nearly 150,000 Rohingya Muslims to Bangladesh in less than two weeks. During Prime Minister Narendra Modi’s visit to Myanmar this week – the third by an Indian prime minister in five years and the second by him in three years – New Delhi did not directly engage with the issue of Myanmar’s treatment of its Rohingya Muslim minority. But at a time when Myanmar is getting isolated, India underlined its support with its joint statement: “India condemned the recent terrorist attacks in northern Rakhine State, wherein several members of the Myanmar security forces lost their lives. Both sides agreed that terrorism violates human rights and there should, therefore, be no glorification of terrorists as martyrs.” Perhaps because of this, Naypyidaw seems to have allowed India to provide aid in the form of infrastructure and socio-economic projects to Rakhine province where violence against Rohingya continues unabated. India has significant geopolitical and security interests that continue to shape its outreach to Myanmar. As China’s profile continues to rise in India’s vicinity, New Delhi would like to enhance India’s presence by developing infrastructure and connectivity projects in the country. India has found it difficult to counter Chinese influence in Myanmar, with China selling everything from weapons to food grains there, and projecting power in the Indian Ocean will become an even greater challenge if China increases its naval presence in Myanmar. No wonder, Myanmar is at the heart of Modi government’s Act East policy with the India-Myanmar-Thailand Asian Trilateral Highway, the Kaladan multimodal project, a road-river-port cargo transport project, and of course BIMSTEC, the Bay of Bengal Initiative for Multi-Sectoral Technical and Economic Cooperation. India is also working closely with the security forces of Myanmar to target the insurgents operating in the country’s northeast. India shares a 1,600-km border with Myanmar which has been very cooperative in flushing the Naga insurgents from its territory. India would like to see the emergence of Myanmar as a robust democracy living in peace with its neighbors. But this is a long term aspiration and India’s past engagement with Myanmar indicates that a hands-off policy has worked much to India’s advantage. A harsh critic of the Myanmar junta since the mid-1990s, India muted its criticism and dropped its vocal support for the opposition leader Suu Kyi in order to pursue its ‘Look East’ policy aimed at strengthening India’s economic ties with the rapidly growing economies in East and South East Asia. More important to New Delhi has been China’s rapidly growing profile in Myanmar. As India realized that Myanmar — one of its closest neighbors and a major source of natural gas — was increasingly under China’s orbit, it reversed its decades-old policy of isolation and began to deal directly with the junta. 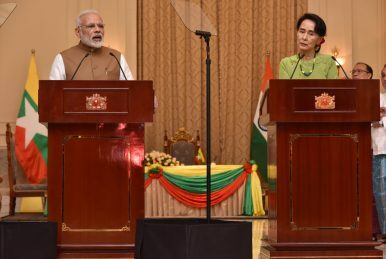 India found it difficult to toe the Western line on Myanmar as it was stuck between the demands of its role as the world’s largest democracy and the imperatives of its strategic interests. The large Burmese refugee community in India is a product of the 1998 military crackdown in Myanmar. Indian elites have long admired the freedom struggle led by Suu Kyi, who was honored with one of India’s highest civilian awards in 1993. But India’s strategic interests in Myanmar have become significant in recent years, especially as China’s trade, energy and defense ties with Myanmar have surged. Strategic interests led New Delhi to only gently nudge the Myanmar junta on the issue of democracy. India has gained a sense of trust at the highest echelons of Myanmar’s ruling elite. As such, India remained opposed to western sanctions on the country. Once Suu Kyi led the National League for Democracy (NLD) to a majority in Myanmar’s first openly contested election in 25 years in November 2015, she became the state councilor and foreign minister. It allowed her to work closely with the military in crafting a new future for Myanmar and this enhanced India’s strategic space to maneuver. And it is that hard-won strategic space that India is loath to give up. Modi’s visit has managed to reinforce that trend in India-Myanmar ties. Latest Violence in Myanmar Confirms Worst SuspicionsMyanmar Open for Business, But Not RohingyaTime to Course-Correct, Aung San Suu KyiIs Promoting Human Rights in ASEAN an Impossible Task?Aung San Suu Kyi: Culpable of 'Genocide'?